Today in Year 5 we have been looking at the problem of ‘SPAM’ and ‘junk mail’. Here is a picture of Charlie’s story. 1. What do you think Charlie thought when he got the email? 2. Why do you think he opened the email? 3. Was it a good idea to click on the Web link? Why or why not? 4. What should Charlie do next? This entry was posted in Year5 and tagged eSafety on March 6, 2018 by Sandford Hill. 3. We think it is good and bad, the good reason is that Charlie learnt to not click on random emails from people he does not know or recognise, bad reason is that he had given himself a virus that he cannot undo / control currently. 3. It was not a good idea to open the link because he could have a virus and someone can see everything on his computer like his personal information .Also someone could steal all of your money and know your phone number! 4. Charlie should tell an adult that he trusts. He should also tell the adult that whenever he closes an advert a new one appears . 1. I think that Charlie got excited because he got a BIG PRIZE but at the same time he got curious. 3. It was not a good idea to click on the website . I think this because there is a possibility that he did not win anything . Also ,it could have unleashed a bad virus . This suggests that it was not a good idea because it possibly not true and it could have unleashed something worse than a pop up (a virus). 2. I think that Charlie opened the email because he thought that he had became lucky and won an amazing prize like a console . I think that Charlie should tell an adult so they can look at it and if they they should take it to a repair shop. 1 I think Charlie felt lucky for winning a free prize. 2. I think Charlie opened the email because he was excited to get his prize for free but he didn’t know it was going to be a spam. 3. I think that it wasn’t a good idea because the email didn’t have a name. Also the email looked suspicious and didn’t look like a real email. 2. 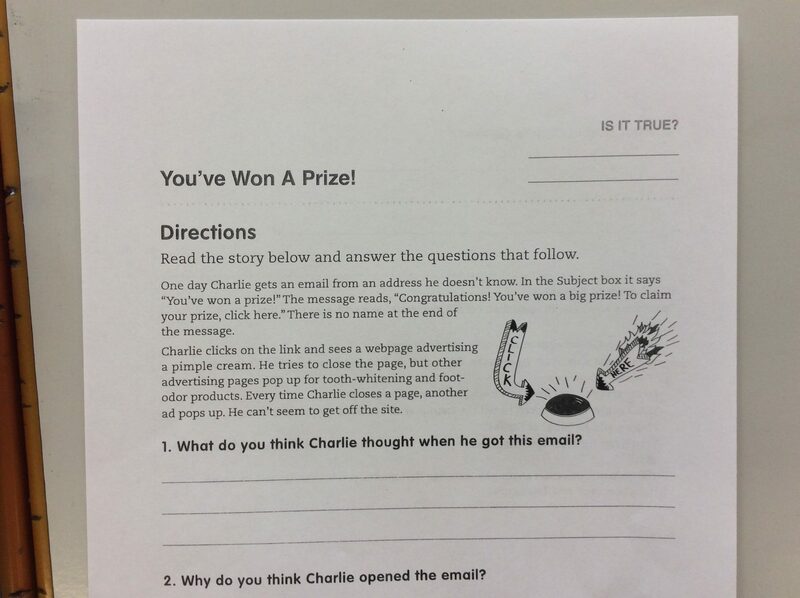 I think that Charlie opened the email because he thought that he was going to get a big prize for free. 1.I think Charlie was feeling lucky for winning a free prize of some sort. 2.I think Charlie opened the email because he could have been curious of what he had won. 3.No I do not think it was a good idea too click the email. 4.Charlie should delete the email and tell someone he trusts like his mum and dad.